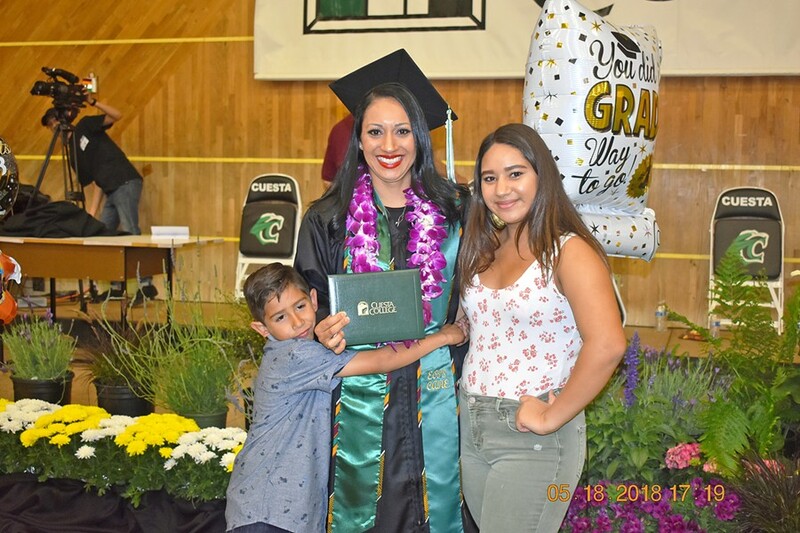 Photo Courtesy Of Vianey Alvarado SUCCESSFUL START Three years of determination has pushed Vianey Alvarado (middle) to graduate Cuesta College's Nursing Program and on to becoming a registered nurse. On May 18, Cuesta College celebrated its 53rd annual commencement ceremony, and its Registered Nursing Program celebrated its 50th graduating class with 46 graduates. The next day, Cuesta's first cohort of 18 students earned a bachelor's degree in nursing. A collaboration between Cuesta College and CSU Monterey Bay provides students the opportunity to complete a bachelor's in 12 months after completing their associate degree. Vianey Alvarado donned a black cap and gown on May 18, graduating with her associate degree. "It still gets me teary-eyed because I never imagined myself in that position. Just hearing my name and hearing my family cheering for me was a big highlight in my life," Alvarado said. That morning, she said, her son woke up and the first thing he did was wish her a "happy graduation day." Five years ago, Alvarado didn't see herself graduating with an associate degree in Licensed Vocational Nursing (LVN) and Pre-Nursing. Now she can't wait to join the future graduating class of registered nurses when she completes the program. In 2013, she was living on her own with her two children, tackling the responsibilities of being a single mother and working full time. "I was just so in the moment. I was a single mom and trying to make ends meet. I wasn't really thinking too far into the future," she said. It wasn't until Alvarado's boyfriend motivated her to think about career goals and creating a financially sustainable future for herself and her family that things changed. "I really had to think about it, I mean I was in my 30s and I didn't have a college education and I didn't have a career. So I thought it was time for me to go back to school and do something for myself," she said. She started with one class at Cuesta College in 2015, but after a conversation with her counselor, Alvarado decided to take the path to becoming a licensed vocational nurse. Aside from the support of her family, she said she has to credit the Extended Opportunity Programs and Services (EOPS) and Cooperative Agencies Resources for Education (CARE). EOPS is a California state-funded program that aids in providing a successful college experience to low-income students facing social, economic, and educational disadvantages. CARE is a state-funded program that assists students 18 years or older who are single head of households with child care expenses. "All the ladies there have been so supportive and have shown me resources that I can use," she said. Alvarado said that being in the classroom and going through the nursing clinical rounds—nursing students are placed with a clinical instructor to develop real-life skills in a medical setting—just made her realize that this was the career for her. "That's where I want to be, I want to help people that are here and help make their day better," she said. "There are some patients that don't do any visits so just being there and talking to them that makes it so amazing." Her next move is work as an LVN for a year to gain experience in the field and continue her education at Cuesta to apply for the Registered Nursing program. Alvarado would then be able to obtain a nursing license. Since 1969, Cuesta College has educated and graduated more than 1,800 nurses. Cuesta Director of Nursing Marcia Scott said many of the graduates stay local and serve the community in a variety of health care settings: hospitals, surgery centers, clinics, long-term care, and forensic facilities. The Cuesta nursing program recently received a Strong Workforce Gold Star award from the California Community College Chancellor's Office health sector. To learn more about Cuesta College's nursing program, visit cuesta.edu.